Product prices and availability are accurate as of 2019-04-25 02:55:58 UTC and are subject to change. Any price and availability information displayed on http://www.amazon.com/ at the time of purchase will apply to the purchase of this product. U=U Socks: Our specialty design art is printed with a high heat and pressure system. This results in bold, crisp colors that don't fade. Socks are individually printed in the USA. This makes every sock unique and so we do NOT GUARANTEE exact placement as shown in the image. The top of the sock has the unique design and the foot of the sock is solid black. Thickness is more like athletic socks, but these can also be worn as dress socks with an office suit. 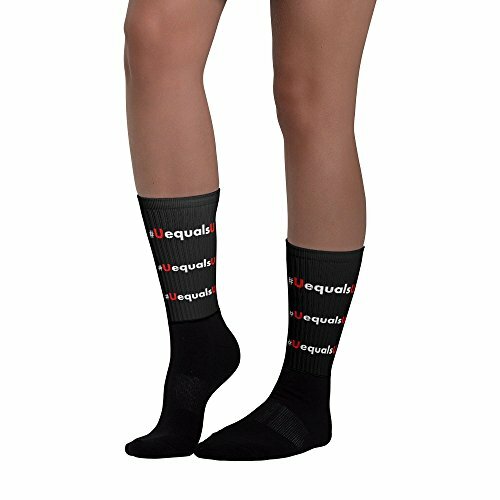 UNISEX SOCKS 1 PAIR: HIV Undetectable Equals Untransmittable Socks CUSTOM MADE IN USA: Please allow 7 days for printing and HAND inspection. We do not guarantee exact placement since each pair is custom made. Design is printed on the ankle and the foot is solid black with slight cushon for maximum comfort. HIV AIDS AWARENESS EDUCATION: Bring awareness by wearing these socks to work out at the gym or to an HIV AIDS walk event. RIBBED NYLON COTTON-SPANDEX MIX MATERIAL: Each sock consists of 22% Cotton, 60% Nylon, 18% Spandex for flattering secure ankle comfort. MACHINE WASH COLD: Recommended to set your washer on cold with like colors and lay flat or hang dry.